Audiobulb Records is an exploratory music label designed to promote creativity in all its forms. Audiobulb releases artist works on CD & download formats as well as multimedia works, VST (virtual instruments), audio hardware and other creative tools. Our aim is to facilitate the development of new artists working within a realm of care, quality and craft. Works supported by Audiobulb often explore the interface between the electronic and natural world. We embrace the complexity of unique electronics, intricate acoustics and detailed microsound. A transplant from the South via Chicago, Craque is the artistic moniker for Matt Davis; a composer, performer, and sculptor now living in Fullerton. Brought up through heavy influences in improvisation and electro-acoustic music, live performances rely on a suite of homebuilt instruments and sampled objects, whose sounds also become the primary elements of studio compositions. 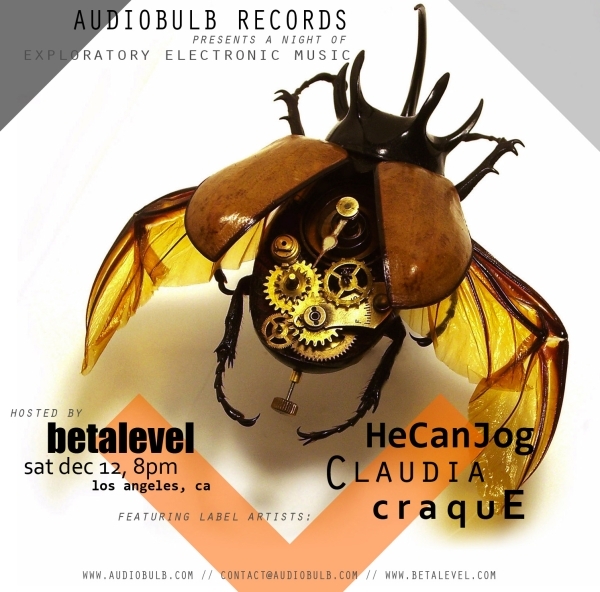 Craque has released the diverse results on labels Audiobulb, Stasisfield, and Xynthetic. Justin Varis (b.Cincinnati, OH 1979) is an American musician/composer living in Los Angeles. Drawing on the rich history of musique concrète while most recently exploring minimal single instrument composition, his music is one of contrast and contradiction. Abstract tendencies conjoin with basic intimate melodies. Disruptive sequencing is utilized alongside loops and repeating patterns. Meticulous audio editing creates calculated timing while improvised passages lend expressive mistakes. Ultimately working towards merging his audio with like-minded video and film artists, he is determined to create a body of work that explores the non-linear narrative while achieving accessibility to the greatest number of listeners. After being featured on a number of stateside and international compilations, in 2006 he released his first EP with Frozen Elephants Music, a non-profit internet project/concert series based in Berlin. Later that year his debut LP was released on Audiobulb Records, located in Sheffield. In 2008, his work was featured along side noted artists such as Taylor Deupree, Dot Tape Dot, Biosphere, John Kannenberg, RF w/ Midori Hirano, Aaron Ximm, Build, Leafcutter John, and Nomand Palace. The project, Audiobulb Records first installation of their “Favourite Places” series, was described by WHITELINE as “encompassing all that is great in compositional field recording” and by Earlabs as “an excellent addition to Audiobulb’s discography demonstrating not only the label’s diversity and commitment to excellence, but also showcasing the talents of several exceptional musicians and sound artists from around the world.” 2009 will see the release of a collaborative project with Santa Barbara electronic musician Kevin Ponto entitled “Help Is On The Way.” The self titled work will be available via Brooklyn label Thelandof in December. He has performed in Los Angeles under the moniker “Claudia” and is now performing material promoting “Help is on The Way.” In addition to his work as “Claudia” and “Help is On The Way,” he is currently working on two new projects. The first is collaboration with UK sound artist David Newman (Autistici). David’s work has been featured on labels such as 12k, Audiobulb, Le-Son666, and Wandering Ear. The second is a work with Brooklyn cellist Greg Heffernan. Greg has performed with musicians such as Lee Konitz, Fred Hersch, Alice Coltrane, Ravi Coltrane, and Jack DeJohnnette. He Can Jog is Wisconsin-bred computer musician Erik Schoster. He records for Audiobulb Records, Distance Recordings, and Home Normal. His music is largely improvised in performance and obsessively organized in recording. XLR8R Magazine calls it “dreamy pop music with experimental electronics.” Middlemarch is out now on Audiobulb Records.